There are a ton of graphic design colleges in California! It’s really something else. It’s likely a combination of the size of the state and the popularity of the field. And, of course, the concentrations of industry jobs in places like Los Angeles and San Francisco. As a state, California is home to more graphic designers than any other state (salaried graphic designers, that is. Kind of hard to track the other ones!). We took a look at the California schools offering Graphic Design Programs. In short, you have a ton of graphic design colleges to choose from. Some of these schools have incredible stats when it comes to elements like employment rates post-graduation. Others offer exceptional education programs and great resources and facilities. Others still have been reviewed favorably by outside publications and insiders alike. 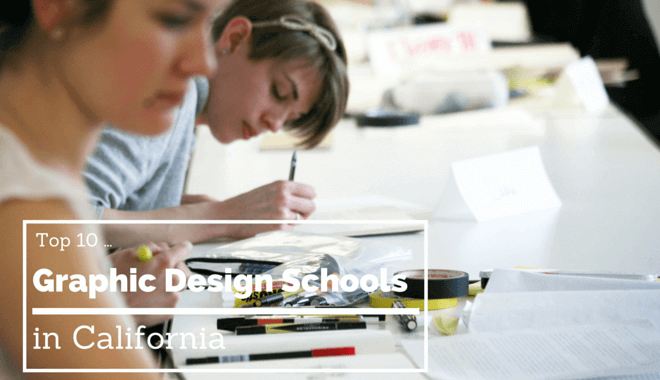 What are the top ranked Graphic Design Schools in California? In the art program, you’ll have access to instruction across a selection of media–drawing, digital imaging, video, painting, printmaking, and more. CalArts makes an effort to provide mentoring and instruction on an individual level–this kind of personal attention can keep you focused on improving and push you to deliver your best work. The BFA Graphic Design Program at California Institute of the Arts is small; the cap is typically 15 students. And just because you make enrollment into the BFA program doesn’t mean it’s smooth sailing for you, either. There is a faculty review of your work at the end of every academic year. And if you don’t pass? You don’t get to keep going. If you think being one of many students vying for one of only 15 spots is daunting, then pity the graduate students. The graduate program is about half the size. That’s right, there is an 8 student cap! The California College of Arts has a large selection of BFA programs to choose from. There are programs featuring 2D and 3D digital work, such as animation and graphic design. There are also a number of programs featuring 2D and 3D physical work–glass, metal arts, painting, sculpture, printmaking, and the list goes on. The benefit of having so many programs in one school is the great potential for interdisciplinary work. Collaborating across disciplines is something you’ll have to do for your entire professional career, so getting a handle on it early is definitely the way to go. The Animation program features instruction by animators from Pixar, Tippett, and Dreamworks–a real powerhouse lineup. The illustration program will have you working on paper and on screen with software. CCA boasts instructors who have won awards for their illustrations. CCA has a San Francisco campus (known as the “innovation corridor”), and a campus in Oakland, just two miles from UC Berkeley. To learn more about the rest of their programs, use the link above. California College of the Arts offers its top-performing students internships from its Graphic Design Internship Program. Tech companies, publishing houses, museums, and even design firms offer up opportunities for students to engage with the designers employed by the companies and institutions. This affords you an opportunity to not only build a relationship with a working professional in the field, but also to network with organizations that might need your help in the future. The more opportunities you line up for yourself, the easier it is for one to fall into place. The curriculum at San Jose State University within the Department of Design is always changing. The faculty at the university recognize the non-stop movement of the industry, and so they always update the technology and the innovative practices to keep abreast of the goings-on in the field outside of academia. Because San Jose State University is right in the middle of Silicon Valley, there is good opportunity for collaboration with the technology and design industries. The University recognizes this and is always making efforts to broaden their design community. Be prepared to cover a wide range of Graphic Design topics as you enter Chapman University. Everything from book design to motion design to web design will be covered. Your time at Chapman University will be all about cultivating your personal voice while honing your verbal articulation and conceptual design skills. The Academy of Art University is based in San Francisco. It’s a school that makes an effort to feel more like a community than a university. This kind of sentiment can lead to an easier time networking, and greater opportunities down the road. Networking is an important skill to develop. If you aren’t networking while you’re in school, you’re missing out on a big part of the value a post-secondary education provides. The Animation and Visual Effects program lets you focus on visual effects, storyboarding, 2D animation and stop motion, 3D modeling, and 3D animation. The Sculpture department at the Academy of Art University has “one of the largest and most advanced facilities of its kind in North America,” and the printmaking facilities are on the cutting edge. Alumni of the illustration program have found work at Random House, Marvel, National Geographic, The New York Times, and more. Comics, graphic novels, advertising, interactive illustration–the BFA in Illustration teaches you the skills you need for these projects and more. The Communication Arts Department offers only three programs, one of which is Graphic Design. You’ll experiment with many forms of visual communication, everything from posters to websites. The Otis College of Art and Design has a Communication Arts Department that now features two programs: Graphic Design and Illustration. At OCAD, you’ll focus on your discipline, you’ll be taught your discipline, but you’ll be working together with students in other disciplines as well. Professionally, you will be working with other departments and people with other skill sets–OCAD prepares you for that by introducing collaboration early and often. These disciplines will have you making everything from tattoos and posters, to apps and ezines. Otis College of Art and Design has strong professional development at its core–as a student, you will be engaged in the field, in some capacity, by the time you leave the college. This usually means an internship, and many students have those internships turn into employment opportunities. OCAD focuses on portfolio development and entrepreneurship, so an internship or employment at a company aren’t the only outcomes you can pursue. Located close to LA, you have an excellent opportunity to engage with the city and the many businesses located within. The Digital Media Department features concentrations in animation, game and entertainment design, and motion design. You’ll learn how to tell stories in a 3D space, using the latest software and techniques to craft the most compelling versions of the stories you want to tell. Alumni who have gone through this program have landed jobs at studios like Pixar, Dreamworks, Disney, Blizzard, Sony Online Entertainment, and more. The Fine Arts Department features faculty who still practice their art professionally. If you’re interested in more traditional artistic disciplines, this could be the program for you. All students spend their first year exploring the disciplines within their major program. You’ll decide on your concentration during your sophomore year, so you have plenty of time to explore the options before locking one in. Upon enrollment at California State University, you’ll be placed in the BA of Art Program. There are four prerequisite courses you need to complete before you can request a “change of objective” and switch to the BFA in Graphic Design. The four courses are: Beginning Painting, Beginning Drawing, Two-Dimensional Design, and Three-Dimensional Design. You also need to achieve and maintain a 3.0 GPA in order to request the switch. If you meet the requirements at the end of your fall semester, you can initiate your request with any full-time department faculty. Small studio classes is the name of the game at ArtCenter. The ArtCenter’s approach to education incorporates strong social and humanitarian elements. The nature of that approach means you can expect a good amount of interdisciplinary collaboration with students from all different majors at the college. This sharpness of focus on your own skills, but inclusion of ideas across disciplines, will help you develop both critically and creatively. Tuition for students is about $40,000 annually. The publication known as Graphic Design USA named Woodbury University in its list of the top 25 Design Schools for 2015. Woodbury prides itself on helping you build a portfolio that stands out in the workplace. With the competition in the market the way it is these days, any old cookie-cutter portfolio won’t cut it. Luckily the class sizes are small, so you will have access to individual attention from faculty. The LA location also means you can tap into some great networking and internship opportunities, with the help of the University itself and with the weight of the Woodbury University name behind you. WU also incorporates civic engagement into its curriculum, giving you real-world experience with impactful graphic design. If name recognition and humanitarianism scratch you where you itch, give Woodbury University a closer look. LCAD gives you a couple different program options within the umbrella of Graphic Design. As seen above, there’s an Illustration Emphasis and also an Action Sport Design Emphasis (one of which happens to be more of a mouthful than the other). LCAD has a very impressive “graduates with jobs in their field” rate. Over 98% of their “recent” (their language, they didn’t specify the years-window) graduates from the Graphic Design Program work in their desired field. Very few schools can boast a claim like that, which is pretty indicative that, like with the other schools on the list, the Laguna College of Art and Design has something special.